The Land of a Million Elephants, as Laos was once known, is opening up to tourists after years of war and isolation. Consequently, a visit to Laos is like stepping back in time and the citizens have retained innocence and charm that is as rare as it is valuable. The mountains and rivers are pristine in this land-locked country, squeezed between China, Burma, Thailand, Cambodia and Vietnam. Our biking sojourn takes us through the Southern Lowlands from Pakse down to the Cambodian border before heading north and then east to the fertile lands of the coffee rich Bolaven Plateau. We cover up to 265 kilometres in 6 cycling days and much of the terrain is quite flat except for the days up on the plateau. There are some great natural attractions and the chance to spot the rare Irrawaddy dolphins makes this one tour that has absolutely something for everyone. Along the way the scenery is constantly changing: we go from arid scrubland to jungle and lush green valleys. The views at some of the places we stay are absolutely amazing and this combined with the changing scenery make this tour a feast for the eyes. 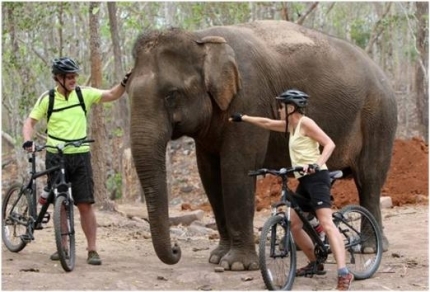 Apart from cycling, we take time out to see 5th Century temples of Wat Phu, some wonderful waterfalls, visit one of the best coffee growing areas in the world and hopefully are lucky enough to sight the elusive Irrawaddy dolphins from one of the Mekong's 4000 islands.